http://www.semissourian.com/story/177254 carried a story about a Cape Girardeau, Mo. Confederate monument being vandalized. This seemingly isolated incident is one of many that are occurring throughout the South. Monuments honoring veterans who fought for the Confederate States of America have been maligned by politicians on both sides of the aisle as well as media outlets. Political Correctness has run amok. It has infiltrated our schools and our communities, resulting in the “dumbing down” of our students, our citizens, our family, friends and neighbors and the end result is ignorance, the latest display of which happens to be the vandalizing of a monument to soldiers from Cape Girardeau County and Southeast Missouri who gave their lives for their homes, their families, their ideals and their country. The Missouri Sons of Confederate Veterans strongly condemns the vandalizing of veterans monuments and calls for the swift prosecution of those who perpetrate these types of acts as hate crimes. “A Civil War monument on the grounds of the Common Pleas Courthouse in Cape Girardeau was struck by vandals who spray-painted both sides of the shrine with apparent pro-Union sentiments, nearly 150 years after the last shot was fired. A two-man crew scrubbed black paint off the monument Tuesday morning. 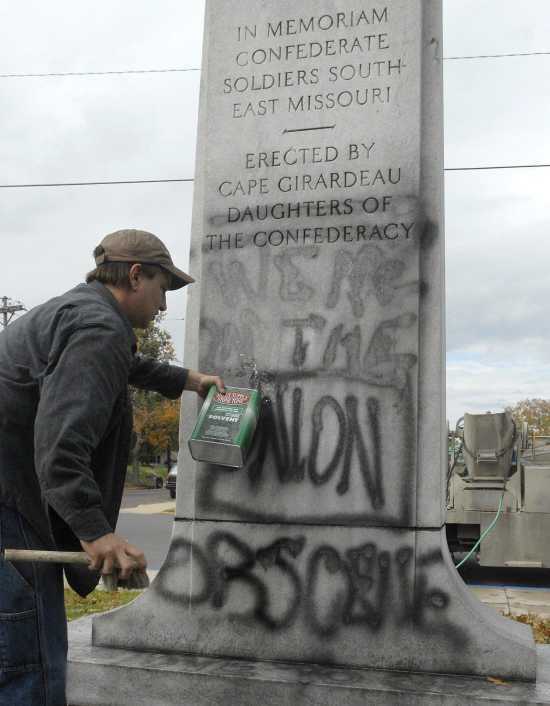 The men, from Marble Hill, Mo.-based Liley Monuments, said they hoped it would be graffiti-free by Tuesday afternoon. The workers from Liley said Tuesday afternoon they had tried industrial solvent and paint thinner, and the words were faded but still visible. One of the workers said getting the paint completely off Tuesday didn’t “look favorable,” but they would continue working through the afternoon. One Hundred, and Forty Six Years ago, on June 24th, 1865, the Poet Priest of the Confederacy, Father Abram Ryan, released his most famous poem, “The Conquered Banner. It appeared in a pro-southern Catholic newspaper, the NEW YORK FREEMAN’s JOURNAL, since then, millions of southern children learned it by heart and recited it in classrooms throughout the south. My guess is that no Cape Girardeau Catholics ever heard of Father Ryan, who was a free lane Chaplin to our soldiers in the Confederate Service, but they should have. Nashville named a high school after Father Ryan. The Sons of Confederate Veterans, Camp #302 in San Diego, CA, named their camp after Father Ryan. A memorial plaque has been erected at his former parish, Immaculate Conception Church, in Knoxville, Tennessee. A memorial park with a statue of Father Ryan is in downtown Mobile, AL. A memorial plaque graces the front of St Boniface Church in Louisville KY, the remaining active portion of the Franciscan Monastery where he died. The adjoining monastery building is now apartments. Why then, should Cape Girardeau Catholics honor this great man, a devoted priest, who risked his life to tend to the needs of loyal Confederate soldiers? It is because Father Ryan has a Cape Girardeau history. Born born on February 5, 1839 in Hagerstown, Maryland, his parents soon moved to St. Louis, Missouri, where he was educated at the Academy of Christian Brothers. Later, Later Ryan studied for the priesthood at St. Mary’s of the Barrens Seminary near Perryville. He was ordained a Priest in the Vincentian order on September 12th, 1860. As a new priest, he taught theology at St. Mary’s of the Barrens and was also listed in 1860-61 on the faculty roster of the diocesan seminary in Cape Girardeau, Missouri. It was from this area, that Father Ryan answered the call of the Archbishop of New Orleans who was recruiting Catholic Priests to be free lance Chaplins for the Confederate Service. Father Ryan began to be absent from duties due to “illness” so that he could travel to minister to troops in Tennessee, and Kentucky, Louisiana. All this makes Father Ryan a notable, highly regarded priest, to risk his life, even though he wasn’t in the Confederate Army, to minster to the troops. However, that may not have been Father Ryan’s greatest accomplishment, though I would venture that to those who Father Ryan attended, they may disagree. Father Abram Ryan is best known as the Poet Priest of the Confederacy. His poems, “CSA”, “In Memoriam”, and “The Conquered Banner” were, and still are, treasured in the south, and helped sooth it in it’s most difficult time, that being when they lost their war for Independence from the tyrannical northern government. Father Ryan published volumes of poems, on the war, the military, and on other circumstances and several volumes of his work is even now available on eBay. Imagine if you will, a Father Ryan Museum in Cape Girardeau. Cape would become a stopping point for not only bus loads of vacationing Catholics, but southerners who remember him fondly from learning about him in their high school years. I am sure that there are records in Cape Girardeau that prove that Father Ryan was at the diocesan Seminary, (St. Vincents) and also at St. Mary’s in Perryville. Some enterprising Catholic ought to look into it as we celebrate the 150th Anniversary of our nations launch of it’s struggle for freedom from the vicious tyranny of the north. At the very least, the Knights of Columbus ought to commemorate a plaque to this great man, this extraordinary Priest, Father Abram Ryan.